Beach Bay Condos community is sold out and is not in active development by builder. If you are interested in Beach Bay Condos or similar new home communities, contact us today! Our agents are very familiar with new and newer construction in Virginia Beach, and can identify resale opportunities in Beach Bay Condos, as well as builder inventory available in nearby or similar communities in Virginia Beach. To view 7 more pictures, interactive maps and the full, detailed description of the Beach Bay Condos community, please Login. New homes with affordable price tags can now be found at Virginia Beach condo complex called Beach Bay Condos. All the fixtures and amenities one would expect to find in luxury real estate, plus the beautiful bay area, can now be bought at a fraction of the price. Located within close proximity to area military bases, this community is right in the thick of it all in Virginia Beach. With everything at your fingertips and the Chesapeake Bay just a short bike ride away, embark on that permanent vacation today at this development. Each condo is carefully crafted using quality materials to ensure a low-maintenance future. Standard features may include granite kitchen countertops, whirlpool tub in master bathroom, hardwood flooring, fenced backyard, attached garage, direct vent fireplace with granite surround, kitchen pantry and much more. So much attention to detail makes these new homes stand out in the sea of Virginia Beach real estate. Beach Bay Condos is a development built on value. Modeled after high-end homes with all the top finishes, these new homes have what it takes to make the short list. Real estate with such craftsmanship is not usually purchased for such small amounts but for the lucky 15 homebuyers here, it will be a lasting investment. This development is nestled in an area of Virginia Beach that is convenient to shopping, expressways, parks and schools but removed enough to watch seabirds fly gracefully outside condo windows. Combinations like that aren’t easily found in today’s real estate market. Enjoy perks that come from living at Beach Bay Condos like being able to visit Bayville Park, Bayside Recreation Center and Chesapeake Bay Beach. Nearby Bayville Golf Club offers world class golfing on a premier course. New houses may be easy to come by but new homes well, that can be a different story. 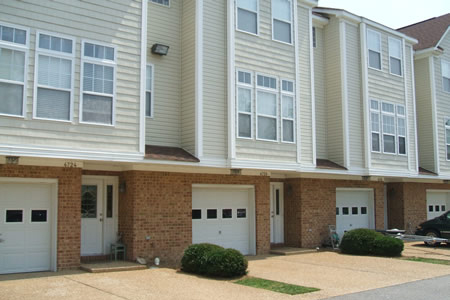 At Beach Bay Condos, a home at the Virginia shore built with quality workmanship at a fair price is what it’s all about. Send me more information about communities similar to Beach Bay Condos. Our agents gladly offer FREE property tours of Beach Bay Condos, Virginia Beach and homebuyer consultations to all serious buyers.